Harry Edward Julius Man was born on 2 January 1822 at 33 Apollo Buildings, Walworth, Surrey, the son of Harry Stoe and Louisa Caroline (Fowle) Man. He was baptized on 1 February 1822 at St. Giles, Camberwell, Surrey. He married his second cousin, Henriette Marie Phillipina Fowle, on 15 October 1860 in Colabar, India. Harry died on 1 July 1864, age 42, at Halstead Hall, Halstead, Kent and was buried on 5 July at St. Margaret’s, Halstead. Henriette was born on 8 November 1829 in Calais, France, the second daughter of Captain John and Mary (McCormick) Fowle, and she died on 15 November 1863 at St. Leonard’s, Sussex and was buried on 25 November at St. Margaret’s, Halstead. Note that Henriette died only a few days after the birth of her daughter, probably as a result of complications, etc. So far we do not have Henriette’s burial record. 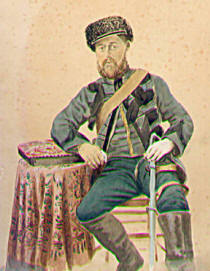 Harry is shown below dressed as an officer of the Turkish contingent during the Crimean War. Sir Richard Burton also served in the Turkish forces in the Crimea and in the book ‘A Rage to Live’, a biography of Richard & Isabel Burton by Mary S Lovell, the author notes that: “All the British officers who served with the Turkish forces wore ostentatious uniforms in order to maintain the respect of the men under their command …” Harry was also one of the supervisors laying the telegraph through Persia. During this time he wrote two letters to his brother Morrice King Man. The Rev. Morrice Man writing in his diaries recalls Harry Edward as follows; Hubert Man’s recollections of Harry are as follows. Sir Julian Goldsmid wrote a book about the laying of the telegraph and Harry appears on a number of pages. Henriette Maria’s father (John Fowle) was a Captain in H. M. 63rd regiment. Between 1862 and 1864 the son Harry dies, Harry Edward himself dies, his wife dies, his brother Morrice King dies, and so does his sister Ella Emma. Below a Russian cross picked up by Harry from the body of a Russian soldier during the Crimean War. (See The Rev. Morrice Man’s recollections of Harry above). Morrice Man’s recollections of his uncle Harry are as follows: Harry was born at Halstead in 1822. [Actually at Walworth]. He became a Major in the Turkish Contingent and fought for the Turks (at Plevna?) 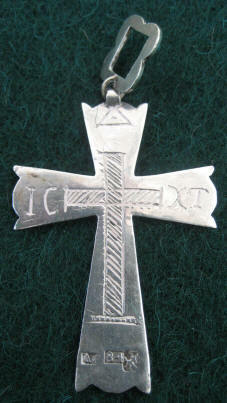 during the Crimean War – I still have a thin Silver Russian Cross (below) picked up on the field of battle from some dead [Russian] soldier. He later joined the Persian Telegraphs. I have in my possession a copy of an interesting letter written to his brother Morrice King Man (they were much attached to each other) from Teheran. It is dated October 14th 1863 describing his journey from London to Teheran via Calais, Brussels, Cologne, Berlin, Konigsberg, St Petersberg, The Volga, Astrakan, The Caspian, Enzelli and Rescht to Teheran (see below). They travelled (three of them) with a Persian servant (who deserted at Cologne to rejoin his former master Capt. Champain) by rail to Berlin where they had to stop a week owing to the Polish rebellion before entering Russia. Ten days were spent at Petrograd thence by Volga steamer to Peva Bazaar, thence post chaise and later on horseback to Rescht, then 200 miles on horseback to Teheran in under four days, changing the horses every 25 miles. Lots of tigers pheasants, partridges – two days over an immense chain of mountains, their vallies (sic), crossing rivers, getting wet all over scenes very grand: At last – 53 days journey from London we sight the chief town of Persia, Teheran not half a bad place? Both Harry and Morrice, judging from photographs were very handsome men (as indeed were William and Garnet). Harry married Harriet Fowle and when he died in 1864 and his wife died also. The two children, Harriet and Ella were taken by his eldest sister Eleanor, Mrs. Morgan Thomas, until they both married. Hubert Man’s notes on his uncle Harry are: Harry Edward Julius Man, son of Henry Stoe Man was christened in Camberwell Church in 1822 (Sponsors, Julius Newell R. N., H. S. Man (father) & Jane Fowle (aunt)) he was educated at Maidstone. He went to the West Indies (Jamaica) sugar planting [probably on behalf of ED and F Man], then went to the Crimean War as Major in the Turkish Contingent. He then got an appointment through a General Mitchell in the Persian Telegraphs. He was at Karachi in India & at Teheran in Persia whence he was invalided home; on his way home he was attacked in a house in Russia & thrown out of a window. H. M. Consul wired “for someone to come & meet him at S. Petersburg.” His brother E.G. Man started but alas stopped by a wire when he reached Hull because his brother had left Russia. E.G. Man awaited Harry’s arrival at Hull, took his brother back to Halstead, there Harry died some three days later. Harry had a very good singing voice. He always took off his hat when he saw a barrel of sugar because he had sugar investments. Introduction: The following two letters were written in 1863 and 1864 by Harry Edward Julius Man (HEJM), the second eldest son of Harry Stoe Man, to his elder bother Morrice King Man (MKM). 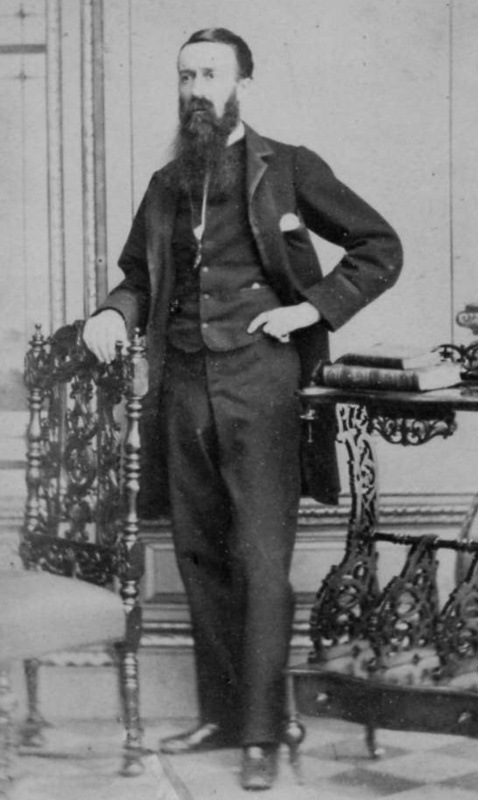 The years 1861 – 1864 were significant for Harry and Morrice. In November 1863 Henriette Marie (wife of HEJM and mentioned in the first line of Letter No. 2) had died. Emma Elizabeth (HEJM and MKM’s younger sister), and also mentioned in the first line of Letter No. 2 , died one day later although the two deaths are not connected. Both HEJM and MKM died in 1864. Caroline Eliza, the daughter of Emma Elizabeth and Charles Edward Walch died in 1862. Squeezed between these years were the births of Morrice and Harry’s four daughters, all of whom survived to adulthood. In the letter HEJM refers to his daughters (Ella, aged 2 years & Harriet 8 months) as the ‘poor little girls’. In Letter No. 2 he also mentions Eleanor who is his elder sister (she raised both Ella and Harriet on the death of her brother) and George who was his younger brother. He also refers to ‘Aunt Ann’ who is Eleanor Ann Man, his father’s younger sister. The best source on the history of the laying of the telegraph from London to India is Sir Julian Goldsmid’s ‘Telegraph and Travel’. The book gives details on three of the people mentioned in the letters below namely: Champain, Walton and Hoeltzer. Goldsmid also mentions Harry Man in a number of places but only in passing although he does mention Harry’s illness and return home. After the letters we hope to put extracts from Goldsmid’s book where Harry Man is mentioned. The illustrations are taken from Goldsmid’s book. My Dear Mo, A Mail arrived here yesterday from Bushire, but not a line for me from anyone in India – are you aware that a Steamer leaves Bombay with letters etc. for Karrachee and the Persian Gulf twice every month?After arrival of mails a courier is despatched immediately up to this — so do write as often as you can. These a/cs I have today sent in asking Champain to send home a bill payable to my mother for the sum, less 50 …, about 250 Rs, I want here. …to the best of my belief has to pay 150Rs, he will recollect, see (endorsement) on bill – the interest should not allow old C(hampain?) – I think we compromised for 50. I paid you see much more than my half – so should not lose out – S went home and forgot all about it – I send the a/c. Tom Hill late paymaster Sind Railway owes me Rupees 188. I sent him his a/c. I suppose I shall have to take what I can get – he never paid a (rupee?). I am glad to hear that all the a/cs are likely to be right with Government they should pay the bills quick and then there would be no trouble. The recpts for … money I left with poor H. I feel sure 774 Rs are still at Karachee. I should much like you, Edward [Edward Garnet Man, younger brother] and Eleanor [sister] to take charge of all monies or whatever I may have for my poor little children and to do the best you can for them, will you do so? I hope when all my debts are collected there may be 1000 – there may be a little money here after my mother told me she should wish any monies that might have come to her sons or daughters to be left to their children in event of death. I will add more before the Post leaves. Love to Jane (his brother Morrice’s wife) & young Liz (his brother’s daughter aged 1 year 10 months). 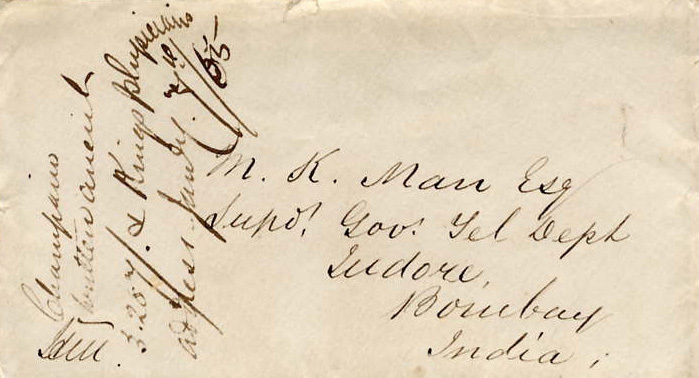 The envelope (above) of the second letter is addressed M K Man Esq, Supd Gov Tel Dept, Indore, Bombay, India, and is crossed Champain and King’s physician. On the reverse is written ‘Found amongst Harry’s papers by me E(dward) G(arnet) Man and sent on to M K M(an).’ Harry clearly was not expecting to live long. Capt Champain presumably recommended his repatriation. He died on 1 July 1864 aged 42 at Halstead Hall, shortly followed by Morrice who died on 16 July 1864 aged 38, while staying with the Walches, Jane’s family, in Hobart, Tasmania. The letter would have arrived after Morrice had died. It is interesting to note that Champain-Bateman, one of the leaders of the British group who laid the telegraph line through Persia, married a daughter of Sir Frederick Currie and that another daughter married Edmund Elliot Lowis. One of the sons of this Currie-Lowis marriage was Cecil Champain Lowis (CCL) whose middle name was probably derived from his mother’s brother-in-law. In 1894 CCL married Sarah Josselyn Man the niece of Harry Edward Man and daughter of Edward Garnet Man. After making arrangements at Shiraz for the despatch of stores expected from Bushahr to points further up the line ; dropping two sergeants at Ispahan ; ascertaining that some of the material had actually reached that city, moreover, that Mr. Man had already set up there two or three miles of posts and insulators, he repaired to his head-quarters at the capital. Here he remained a month, unsuccessfully endeavouring to obtain poles for his superintendent, so that work might be begun in the Tehran district. Then, thinking the locality the most likely to meet the exigencies of the occasion, he sent Captain Smith and his party to the city of Kum, a main station within his range of superintendence. The five divisions were apportioned as follows. For the line from Tehran west, or joining the Persian with the Turkish and European systems. 1st. Lieut. Pierson, R.E., from Baghdad to Kangawar. 2nd. Mr. H. V. Walton R.E. from Kangawar to Tehran. For the line from Tehran south, or joining the Persian Land lines to the Indian Submarine Telegraph. 3rd. Captain Smith, R.E., from Tehran to Kohrud. 4th. Mr. H. Man, R.E. Kohrud to Murghab. 5th. Lieut. St. John, R.E. Murghab to Bushahr. The illness and departure of Mr. Man, the officer originally appointed to the fourth division, has already been mentioned. That gentleman died immediately after his return to England. No separate report of the division under his charge accompanied Major Champain’s general letter to the Bombay Government : but the Director bore flattering testimony to the manner in which Mr. Hoeltzer had taken up and completed the work of the deceased superintendent [Harry Man].